Note: The talented and troubled English soul singer Amy Winehouse died this weekend at the age of 27. To help us understand the cultural and personal impact of losing such a talented person so prematurely, we the good people of Et tu, Mr. Destructo? turn to noted family man, Christian and tireless workaholic Bil Keane, creator of the comic strip The Family Circus. Thing to Do? Not Me. One time I told my dad that heaven must be getting pretty crowded, because everyone who dies sure is special and got hugged by someone sometime, and my mom always said that getting a hug is like someone handing you a ticket to feeling happy. Then again, now that I think about it, it must be getting crowded just getting to heaven! Climbing old Jacob's ladder with so many people has got to be pretty darn difficult with folks in front of you stoppin' halfway to look at how small everyone down here on earth is. That nice lady Amy Winehouse died the other day, which was too bad, because she was what they call gifted—in the good way! I made this picture for her, because she was like a princess, but for music. She was so good at singing soul music that you had to see a picture of her to figure out she wasn't black. I only heard her once on accident, because the only radio dad lets us listen to is the droopy guy on the NPR who likes banjo music and talking about Minnesota. Say, why do you think we all listen to so much music on the radio? Probably because we have to tune in! I figure right now Miss Winehouse is having cake with my grandma who's a ghost in heaven because today's her birthday for the rest of forever, and you should get cake on your birthday. Besides, she probably needs it because she's got to feel bad. My dad told me she died of taking a bunch of pills and some wine. I guess this goes to show why my family doesn't use modern medicine, because it's not part of God's plan. Or why you have to write out instructions better. When her family gave her the last name "Winehouse," it looks like she thought she had to use her tummy like one! I was talking to my grandpa this morning. He and my grandma are both ghosts, but she haunts the kitchen and the yard, and my ghost grandpa only shows up to watch me use the bathroom when I have to make stuff come out of my bottom. Also when I'm changing. He said Miss Winehouse will show up in heaven no matter what. I sure hope so, but there are probably a lot of scary things between dying and getting to heaven. 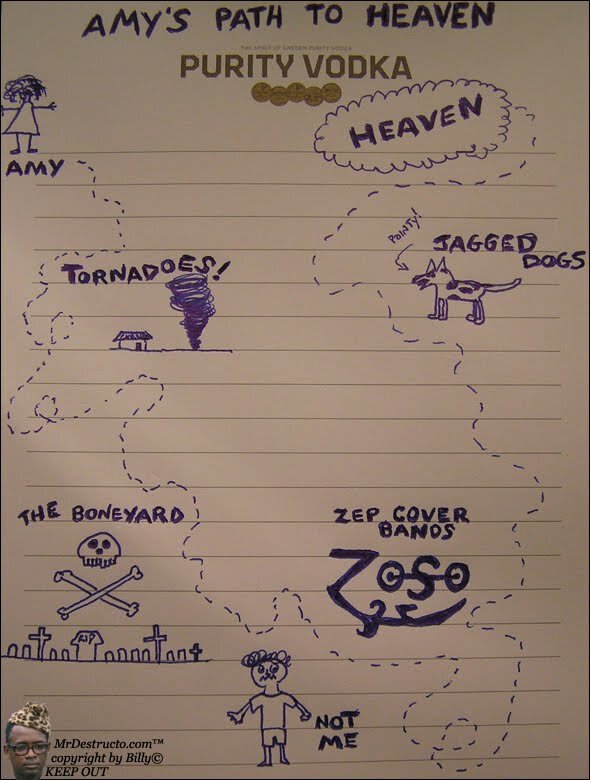 To help her out, I drew her a map. My dad says he doesn't need maps, but my mom always likes to use 'em on trips. Lucky for Amy she doesn't have to fold this one! I don't know if this map'll work. Dying is like that one fence that your life sneaks under, and only one person ever got to hop back over the fence, and that was Jesus. Maybe she won't need it. My uncle always said that if you're ever in doubt, you can find the truest map by looking in your heart. He died of a heart attack, so that just goes to show he had a lot more heart than anybody. He's a ghost now too, but I don't see him unless I go to the gym at the school. Billy Keane is the son of Bil Keane. He has night terrors and wants to see what the inside of his neighbor's cat looks like.